Wisdom teeth are the final set or third set of molars that you are getting in the late teens or at nearly around twenties. Wisdom teeth are very useful in chewing when it is properly placed and in good health. 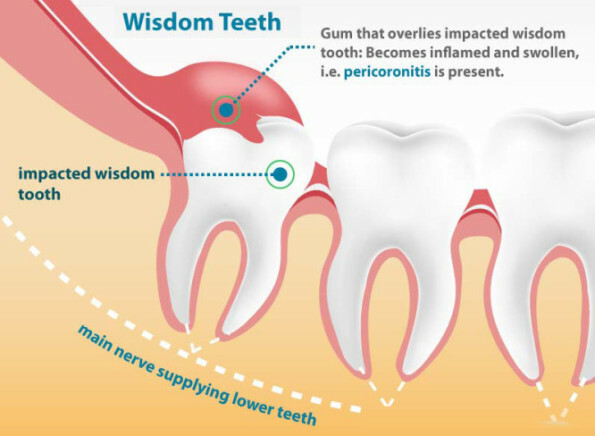 But many people are experiencing problems with wisdom teeth due to misplaced or impacted in the mouth. When a wisdom tooth causes problems to other teeth or causes difficulties or pains in the mouth, it may need to remove. A dentist can check for the cause & dental problems and can suggest the proper treatment for you in such situations. At ‘All Smiles Dental Clinic’, located in Dubai; Wisdom tooth extraction is done only after checking all the possible options to save your teeth. Even after checking all the options of saving the teeth is not possible, dentists will suggest for wisdom tooth removal. Wisdom Tooth extraction is required mostly when the tooth is misaligned in the mouth. The misalignment can cause problems to the adjacent teeth or to the nerves or jawbone. In such problematic situations, wisdom tooth extraction will become necessary. Sometimes a wisdom tooth can be impacted. They may only partially erupted through the gum. This partial eruption or breakthrough can cause bacterias to enter the gum and around the tooth and can cause infection. Sometimes the position of wisdom tooth inside the mouth will cause difficulty to reach the brushes to clean them properly. When proper brushing and flossing is not possible, the chances to get dental problems like tooth plaque, infections, and decay will be more. To know more about wisdom tooth extraction, click the below link.